Telangana Board of Secondary Education will be declaring the Class 10 results tomorrow, i.e on April 27, 2018 on their official website. Candidates can log in to the official website bse.telangana.gov.in to download their results. The results will also be available at results.cgg.gov.in and examresults.net. The Telangana Board of Secondary Education is all set to announce the Class 10 TS SSC Results 2018 tomorrow, i.e on April 27, 2018 on the official website, bse.telangana.gov.in. The results are expected to be out at around 10 AM and candidates, who had appeared for the TS SSC Class 10 examination 2018 can log on to the official website to avail their results online. According to reports, the results will also be available on another website results.cgg.gov.in. Moreover, after the results are out, candidates will be able to take a print out of the e-marksheet from the official website of the board. The Board of Secondary Education, Telangana for public and private schools under the state government of Telangana was formed in the year 2014 in the month of June. To avail the e-marksheet, students have to keep their roll numbers handy so that they can download the result as soon as it is released on the official website. Meanwhile, the students will get their original mark sheet issued by the schools. 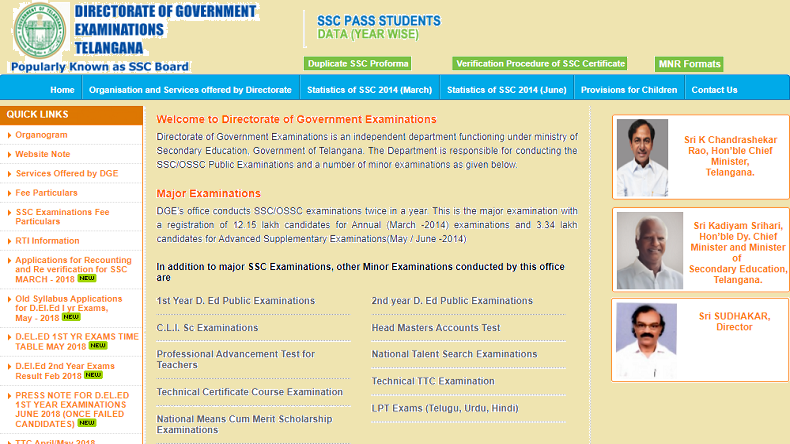 The TS SSC Results 208 will also be available on examresults.net. Now download and take a print out of the same for future reference.